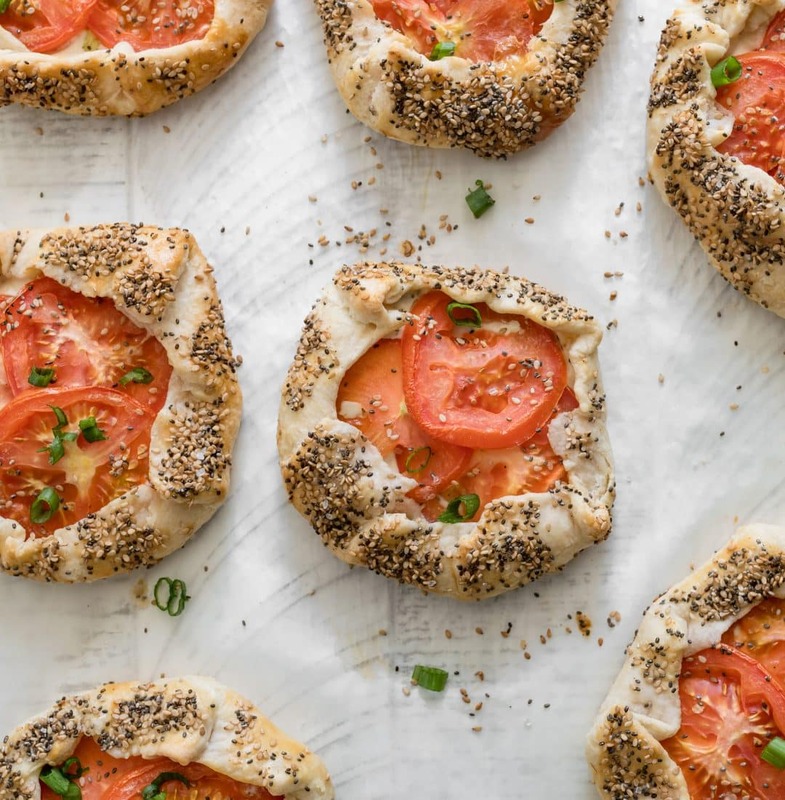 Recipe for Tomato Hand Pies with a goat cheese and green onion filling. Crispy pie crust topped with chia seeds, sesame seeds, and coarse seas salt. Excellent breakfast or mid day snack. I know its early March, but I’m dreaming about planting tomatoes in my backyard. Vine ripened tomatoes are always bursting with flavor and you can utilize them in so many dishes. I’m making a list of things I want to create this summer! What’s your favorite way to prepare them? Whisk together the flour and salt. Add butter and water then begin mixing with hands. (add water as needed) Squeezing and working butter into flour until forms dough. Remove dough from fridge and cut into 8 even parts. Form each section into a ball. On floured surface, roll out one ball into a 6-7 in circle. Spoon filling into center of circle leaving an inch around the edge. Lay three tomato slices in a triangle shape over filling. Fold over the dough into the center, adding pleats with each turn. Brush outer crust with egg wash.
Sprinkle topping onto coated crust. Bake for 20 min, or until golden brown at 400 F.
Let cool for 10 min. before serving. Sprinkle additional green onions on top! Slice tomatoes and place on paper towels to dry. Sprinkle with fine sea salt. Combine goat cheese, egg yolks, and onions in small bowl. Combine seeds, garlic, and salt in a separate bowl. Not only are they gorgeous, but they are delicious!! Perfect for brunch, a quick lunch, a grab and go, or a dinner side. I know you will love them too!